Howard and Mary Plummer, 1924. In Bolivia (probably on the Pantiel Experimental Farm, there) . Photographer unknown. From: These Sixty Years, 1887-1947. Being the Story of First Baptist Church Vancouver, BC. By: W. M. Carmichael. It isn’t clear why the family moved to Canada in 1913. They initially moved to New Brunswick and Howard entered a boarding school in Rothesay. In 1917, the Plummers moved west to Saskatoon where Howard finished high school. Following that, he spent two summers on a prairie farm and two winters at the University of Saskatchewan. In 1920, the family moved yet again, this time to Vancouver, where Howard enrolled in the Agriculture faculty at UBC. He graduated in May, 1924 with a B.S.A. Dr. and Mrs. Plummer joined First Baptist Church in 1921. Howard was baptized and also joined the church in that year. 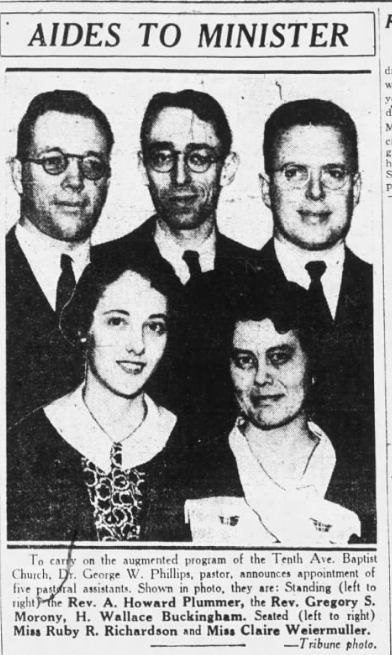 For 2 years, Howard was “Efficiency Superintendent” (whatever mysterious responsibilities that position entailed) of the Vancouver Association of the Baptist Young People’s Union (BYPU). In 1923, he was President of the Provincial BYPU. And in 1924, was Superintendent of the Hastings East Baptist Sunday School. It seems that sometime in early 1924, Plummer approached Rev. J. J. Ross (1870-1935), the pastor at FBC, and expressed interest in serving as a full-time Baptist missionary in Bolivia. Whatever it was that inspired him to want to serve in that South American country, he had certainly said the ‘magic word’ among Canadian Baptists at the right point in time to receive a positive reception. He met with an assortment of Baptists (clergy and laity) who gathered at FBC on August 27th to form a council of examination and ordination that ultimately would decide that Plummer had indeed been called of God for service in Bolivia and, indirectly, that he had the ‘right stuff’ for this task. At the time that Plummer was undergoing his ordination exam, he was also engaged to be married to a young woman who had grown up in First Baptist, Mary Evangeline Pattullo. Not much is today known of Mary. She was one of three daughters born to Mr. and Mrs. James Pattullo, a Vancouver barrister, who had been granted the designation, King’s Counsel (K.C. ), and was a senior partner in the firm of Pattullo and Tobin. Mary was baptized at FBC in 1912 and became a member of the church that year. It isn’t clear how long she had been Plummer’s “bride elect”, but I’d wager it hadn’t been long; probably it had just been from a few months prior to his August 27, 1924 ordination exam. They were to be married a week later, on September 2nd. The Ordination Council “unanimously and enthusiastically” approved of Howard Plummer’s responses to their questions and was “voted into fellowship” by them. Later that day, during an evening service at First Baptist Church, a congregation of some 1800 packed FBC for the service at which Plummer was formally ordained for Gospel ministry as signalled by the “laying on of hands”. Among those on hand at the service was former FBC pastor, Rev. Dr. J. Willard Litch, Superintendent of Missions in B.C. and Alberta. And, even more notably present was 85-year-old B. C. Baptist “Pioneer” Rev. D. G. McDonald who was present to give “the charge” to the candidate. “Infrequently is such a charge delivered to a young minister or missionary!” enthused the official account of the service in FBC’s minutes. Clearly, great things were expected of Plummer and of his service in Bolivia. It isn’t clear from FBC’s records when exactly Rev. and Mrs. Plummer departed for Bolivia, but it was likely late 1924 or early 1925. Whether they received any formal training for what they would face overseas (and in Bolivia, in particular) isn’t clear. But it seems likely that if they received any preparation or language instruction for their time there, it was minimal, certainly by today’s standards. There is no information that I’ve been able to dig up pertaining specifically to the contribution of Howard and Mary Plummer in Bolivia. There are accounts of contributions made by a number of Canadian Baptists in that country prior to and around the period of the 1920s. It isn’t clear whether they had any break during their 5-year term in Bolivia. However, at the conclusion of their first term in 1930, they had earned a furlough. How lengthy a rest period this was to be isn’t clear, but it was certainly a matter of months, perhaps as long as 12 months. Howard’s name appears in the Vancouver Directory for 1930. At the time, he was living in one of the 5 units in Caroline Lodge (305 W. 12th Avenue; extent), where Mr. and Mrs. Pattullo, Mary’s parents, also resided. His name appeared with the abbreviated honorific, “Rev.”, and with the occupation, “missionary”. It isn’t clear whether or not Mary was living with Howard at the time. Her name doesn’t appear in the listing, but that was more the rule than the exception at the time, when it came to showing the spouse of the “head of household” in city directories. (For example, the listing for Mr. & Mrs. Pattullo appears simply as “Patullo, J M”). 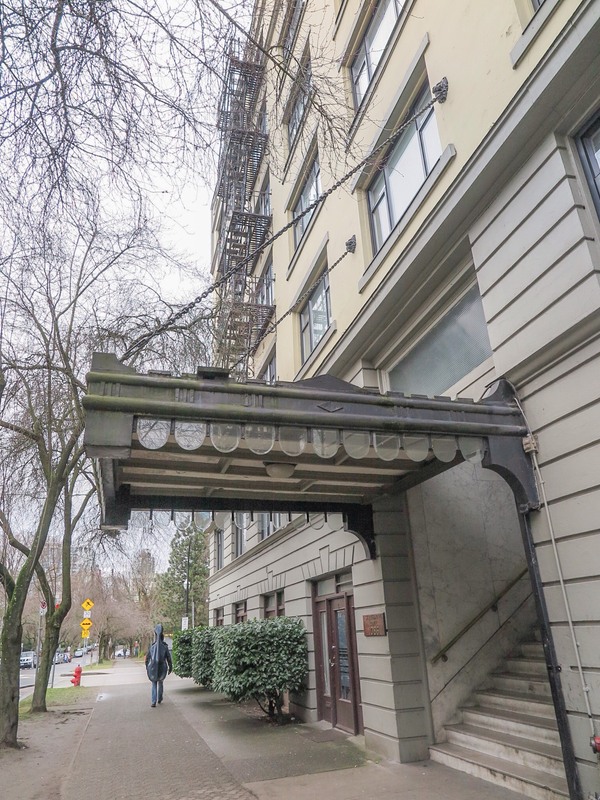 On August 7th, 1931, Mary Plummer went to the roof of Strathmore Lodge (1086 Bute Street; extant; about 3 blocks SW of FBC, as the crow flies) and jumped. The fall would have been one of 8 stories (7 residential levels plus the roof). Death appears to have been instantaneous. She suffered multiple skull fractures. No autopsy was deemed necessary. The coroner’s investigation (the day after Mary’s fall) seemed to conclude that the underlying cause of death was mental illness that led her to suicide. Why Mary chose Strathmore Lodge to jump from, I don’t know. Perhaps she knew someone who was residing in the building at the time (although I’ve scanned the names of those living there, as listed in the 1931 city directory, and don’t see any names I recognize). Who can say, especially at this great remove, what was going through her mind when she felt moved to go up to that roof and jump. Strathmore Lodge, Vancouver’s West End. 2017. Site of Mary Plummer’s 1931 death. Author’s photo. The obituary for Mary Plummer was very basic. But it suggests an interesting clue pertaining to the life of the Plummers just prior to Mary’s death. Mary’s obituary described her husband as “Rev. Arthur Howard Plummer of Chemainus”. Huh? He’d been living in the same home as his in-laws, presumably with Mary, in Vancouver in 1930. Between then and August 1931, it seems clear from this, Howard and Mary had separated and he’d moved to Chemainus. There is nothing in the Chemainus directory of that year (or subsequent years) to confirm that he had taken up residence in that town. He may have been bunking with a friend. Whether he reached the conclusion before or after Mary’s suicide, Howard decided that he didn’t want to return to the mission field in Bolivia. In fact, his mission career was over. He decided to pursue a ministerial career; and so he sought a job as a church pastor. Openings for Baptist ministers at that time in B.C. were not thick on the ground. The Great Depression was just ending. And there was significant disunion within the B.C. denomination since the ‘Big Split’ of 1925 into the Regular Baptists and the Convention Baptists. Oakland Tribune. 4 Jan, 1934. So it isn’t surprising that Howard looked to the United States for work. He found employment in 1934 with Tenth Avenue Baptist Church of Oakland, CA. That church was looking to expand their staff from a solitary pastor to a pastor and five associate ministers, or ministerial ‘aides’. The position which Tenth Avenue wanted to fill with Howard was one of three ‘pastoral visitation’ ministers. This seems to have been the ideal post for Howard. He had had no real pastoral or theological training as far as I can tell. Nor would he have had much opportunity in Bolivia to hone any sermon delivery skills he might have had. But he could probably swing the job of “pastoral visitation”! He seems to have remained in that job about four years. By 1938, he’d accepted a call to be the pastor at Visalia (near Fresno, CA) Baptist Church. It isn’t certain that Mary’s suicide was directly linked to the prospect of a return to Bolivia. It may have been, or it may have been that Mary despaired over the state of her marriage, or that some other factor was in play that we aren’t privy to. The Ordination Examining Council plainly didn’t consider Mary to be a full partner with Howard in his ministry work in Bolivia. She received only a single mention after the Council had pronounced “enthusiastically” in favour of Howard: “At the conclusion of the ordination. . . a beautiful bouquet [was presented] by the ladies of the Church to the bride elect, Miss Mary Evangeline Patullo, whose marriage to the Reverend Arthur Howard Plummer, B.S.A. will take place in the church on September 2nd.” This, it seems plain, did a real disservice to Mary. A bouquet would not serve her well during the five years ahead in a wholly foreign country. 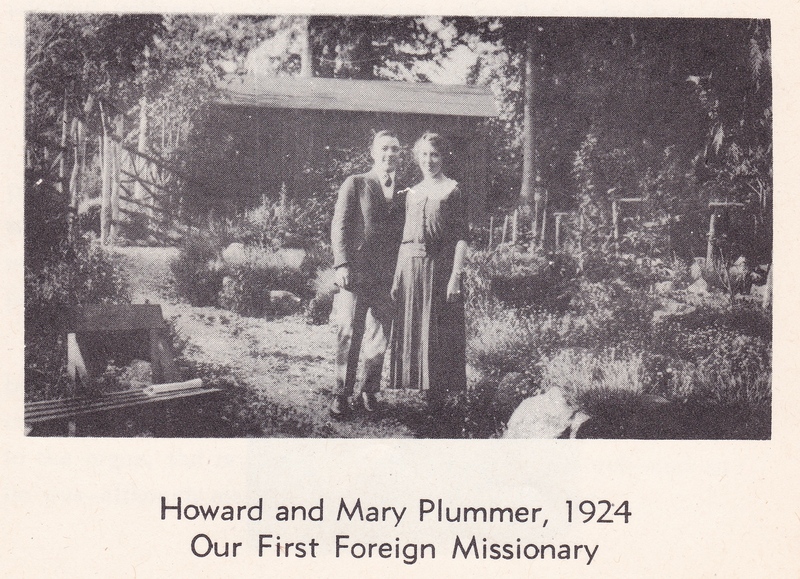 Howard and Mary Plummer were ‘green as grass’ when they were sent to Bolivia by First Baptist. They deserved more preparation for what they would face; for the loneliness; for the absence of family and friends and things that they were accustomed to. *Thanks are due to Dr. Donald O. Anderson. His ‘fingerprints’ are all over this post. Thanks for reading patiently and providing sage counsel as I unloaded on you regarding this one, Don! **My thanks to Neil Whaley who tracked down Lulu’s surname, date of birth, and occupation. ***Thanks also to Karalu, for correcting the death years of Howard and Lulu. Howard and Lulu were her grandparents. This entry was posted in biography, churches, First Baptist Church, Vancouver, USA and tagged Arthur Howard Plummer, Baptist Young People's Union, bc, BC Faculty of Agriculture, Caroline Lodge, Dr. William Edwin Plummer, Hastings East Baptist Sunday School, history, Lulu Helen Plummer, Mary Evangeline Pattullo Plummer, Neil Whaley, Rev. D. G. McDonald, Rev. Dr. J. Willard Litch, Rev. W. M. Robertson, Rothesay, Strathmore Lodge, Theodore Plummer, vancouver, Wenchow. Bookmark the permalink. What a terribly sad story. I was shocked when I read about poor Mary jumping off the bridge. There are so many pitiful stories out there. I feel so sorry for the Mary’s of the world. Sorry, meant to say “roof” in comment above, not “bridge”. He was my grandpa and I have his Bible from Bolivia. He and my grandma Lulu adopted three girls and the youngest was my mom. I loved reading this. Thank you. We never knew much about his first wife. He was a wonderful man of God who died of cancer on Christmas Eve and went home to be with our Lord. Thanks so much for being in contact! I just found a picture of his grave stone and he died in 1980 and his second wife Lulu died in 1983. A friend noticed a discrepancy between the month that I claimed Howard died (I said June) and the month you have identified above (December). Can you confirm it was December? Thanks very much. My mother should have that information. I believe it was in the late 70’s or early 1980’s I was pretty young. He died in the hospital in Longview, WA I remember going to the hospital to see him with my mom. His ashes were taken to a cemetery in Canada I believe to be by his parents. Yes it was December 24th just not sure on the year. Thanks for your work on this. If you learn what year Howard died, I’d be obliged. Thanks very much for tracking down this info. I will correct the text.